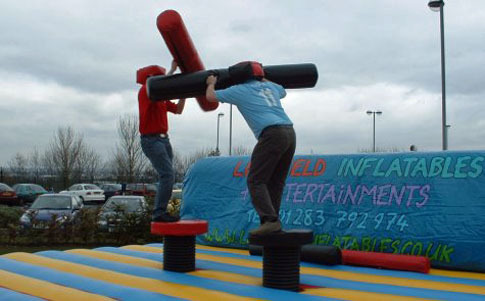 Hire Inflatable Gladiator Game. Brilliant Gladiator Duel jousting game. Hire Today! Balance challenging jousting fun as the two competitors try to knock each other off their gladiator podium with the padded pugil sticks. We have two versions of this Gladiator game one with solid podiums that's suitable for all ages, and one with larger inflatable podiums for under 16's. Great fun for children and adults alike. Recreate the TV program of the 80's! 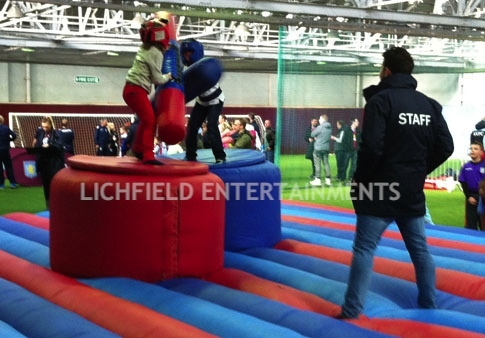 The gladiator game can be operated indoors or out and requires an overall space of approx 25x25ft for the solid podium version and 30x30ft for the inflatable podium version. Both require a 12ft height clearance if you're holding your event indoors. Try and bash your opponent off the pole with a pugil stick onto the soft inflatable below. Ideal for fetes, parties, corporate events and fundays. Pillow Bash requires an overall operating area of 18x18ft and height clearance of 11ft. 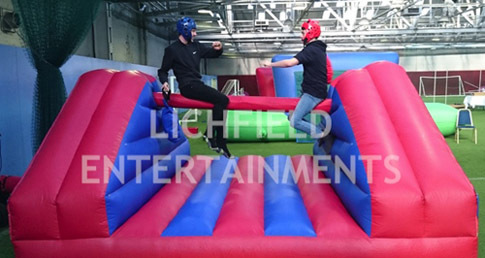 Our Rock 'n' Roll Joust inflatable is a great variation of the more traditional Gladiator Duel types above where both players stand on the same podium that's supported by air pressure. The podium can tilt in any direction depending on the players movement so balance and movement are just as important as your jousting skills. If you have any queries, questions, or would like hire the Gladiator Duel or Pole Joust for your event please call us on the number below or click to enquire and we will do all we can to help.